US, 1938, 97 minutes, Black and white. James Cagney, Pat O’ Brien, Humphrey Bogart, Ann Sheridan, George Bancroft, Billy Halop, Bobby Jordan, Leo Gorcey, Gabriel Dell, Huntz Hall. 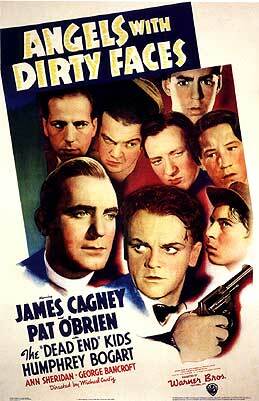 Angels With Dirty Faces has become an archetypal New York gangster film. In fact, it features the group The Bowery Boys, led by Leo Gorcey and Huntz Hall, who had appeared in William Wyler’s film version of Sidney Kingsley’s play, Dead End, in 1937. However, the focus in this film is on two men who had grown up together in Hell’s Kitchen. They both had the opportunity to become criminals. Rocky Sullivan followed that path. The other, Jerry Connelly, went on to the priesthood. When Rocky Sullivan returns to New York to confront the big bosses who have his money and to get back into racketeering, he encounters his friend Jerry who is working for the young people in the area who have the option of following either path. In this sense, the film is very socially concerned for the underprivileged and the gangs in New York – a common theme from the 19th century as well as into the racial groupings in Hell’s Kitchen and the areas near by in such stories as West Side Story. James Cagney won the New York Film Critics’ Circle award for best actor for this film. He had appeared in Public Enemy and created a strong gangster presence which he was to continue in the 40s with White Heat and in the 50s with Love Me or Leave Me. However, he was also a song-and-dance man with such films as Footlight Parade and in 1942 he won an Oscar for best actor as George M. Cohan in Yankee Doodle Dandy. Pat O’ Brien was a much more stolid screen presence and was a priest in several films including Fighting Father Dunne. He was also the baseball coach, the Gipper, for Ronald Reagan in Knute Rockne – All-American?. Humphrey Bogart had been playing criminals in a variety of films up till this period including The Petrified Forest. He was to emerge in the early 40s as a strong star. The leading lady is Ann Sheridan who was to have a successful career, especially in melodramas at Warner Brothers during the 1940s. The film was directed by Michael Curtiz who directed a great range of films at Warner Brothers during the 1930s from The Private Lives of Elizabeth and Essex to Virginia City and The Sea Wolf and The Sea Hawk. He was to win an Oscar for directing the classic Casablanca. During the 1940s he directed such films as Mildred Pierce as well as the story of Cole Porter, Night and Day, but after that moved to much lighter films, especially a number of musicals and spectacles like The Egyptian, White Christmas, The Vagabond King. 1. The significance and tone of the title, the humour and the sentiment? How were these borne out during the film, successfully? How typical an example of 1930s film-making was this? locations, black and white photography? Comparison with nostalgia films about the 1930s? 3. How interesting was the picture of gangsterism in America as portrayed during its day? Comparisons with the later American nostalgic memory? How rosy a picture of gangsterism? How pessimistic? 4. How interesting was the picture of America in the 20s and 30s? As seen by the people of there times? The gangster background, the violence, the hero worship, the prospects for the future? Comparisons with later decades as regards gangsterism and violence? 5. Comment on the tone of the opening: two boys in the slums, the girls, the houses, the stealing, the running away from the police etc? How did this set the tone for the rest of the film? Convincingly? The relationship between Gerry and Rocky? Rocky as the leader, Gerry as following, running faster, wanting to give his support to Rocky? Rocky's isolation? This as a basis for the working out of the relationship during the film? The film's comment on reform school and prison? Its effect on Rocky? The technique of the collage and the passing of time? The insight into criminals and prisons and their effect on them? 6. How interesting a character was Rocky? James Cagney's style and performance? The hard side of Rocky md the way that it was presented: the deals, the toughness and violence, the prison effect, his pressure on Frasier etc? 7. Was this convincingly balanced by the soft side of Rocky? His meeting with Lorry, his getting the apartment, his seeing Gerry again, his memories of his choir boy days, helping the kids with the basketball, his relationship with the boys, his final relenting to give and example to the boys? Was this good side and bad side convincing? 8. How interesting was the presentation of the gangsters like Frazier? The world of crooked deals, the world of fears? The nature of the deals and double deals and the inevitability of death? Did these criminals seem real? 9. What comment was being made on the crime world of the 30s? Political corruption, police corruption, Rocky's arrest and then his being let go? 10. How important were the sequences of the exposure of the corruption? The role of the crusading priest and his role as exposing injustice and corruption? 11. How interesting was the sub-plot with the boys? As images of Rocky, their stealing his money, his tracking them down, his relationship with them, their loyalty to him especially with the money, their splashing the money about, the relationship with Gerry? The importance of their giving the example of Rocky's cowardly death? Did this seem realistic, sentimental? 12. Laurie as a character, product of the same background, her story abut her marriage, the attraction to Rocky, her relationship to Gerry, her support of Rocky etc? Was she conventional, more than a conventional heroine? 13. How strong was the ending? The prison scenes and Rocky's stubbornness? How convincing was his change of heart, the way that it was filmed in silhouette? How important for a moral ending was this? Convincing? 16. How original was the story and its treatment? How much the basis for later cliches? The American gangster genre and its sentiments and Americanism?